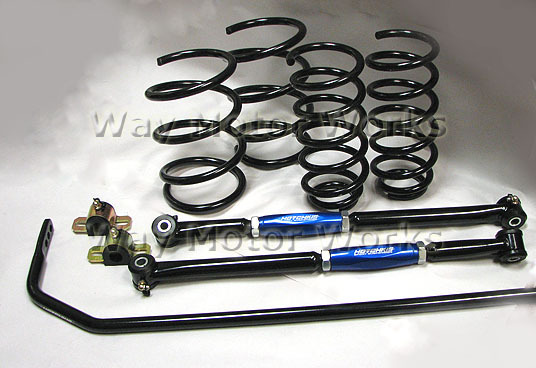 The springs will lower your car only slightly allowing you to maintain good shock travel even with your stock shocks. They are also linear springs giving you perfect feel and predictability. And since your lowering your car you will need to the lower control arms for the rear we've included. Otherwise you'll end up with too much rear negative camber and eat up a set of rear tires quickly. But what would the package be without the biggest bang for your buck, but a rear swaybar. Since you have the rear springs out this will be an easy install. Plus it will make your car more neutral and keep the car flat during hard cornering, making you much faster. Please select your model below to make sure we get the right springs and also select if you want the 19mm or Comp rear swaybar. Way installed this kit last year on my 2008 S model and words cannot describe how much tighter and predictable it is in cornering. I absolutely love the setup. Way also seems very knowledgeable about Mini mods. Jason installed this package on my 2010 MINI S Clubman. What a diifference, it's only too bad that I can't drive it at full appreciation speed. Ride feels softer than on OEM, unless your bottoming out or motoring around a turn. The lowered look it creates makes the car much better looking from the curb.Doesn't feel like it needs an alignment, but getting one anyway since the new springs should have settled after 750 miles on them. WMW installed this on my justa at MOTD 9. All I can say is \&quot;why did I wait so long\&quot;? It is like having a brand new car. I installed this kit over the weekend and am very impressed with the performance gains for the dollar. I am running the 19mm bar in the stiffest setting and feel is it just right for the street (turn the stability control OFF or any mod is a waste) Very happy with parts & service from Way.